. Edo - Reference and LINKS . The system of Japanese era names (年号 nengō, "year name") was irregular until the beginning of the 8th century. After 701, sequential era names developed without interruption across a span of centuries. ..... The system on which the Japanese era names are based originated in China in 140 BC, and was adopted by Japan in AD 645, during the reign of Emperor Kōtoku. The first era name to be assigned was "Taika" (大化), celebrating the political and organizational changes which were to flow from the great Taika reform (大化の改新) of 645. Although the regular practice of proclaiming successive era names was interrupted in the late seventh century, it was permanently re-adopted in 701 during the reign of Emperor Monmu (697–707). Since then, era names have been used continuously up through the present day. ..... In historical practice, the first day of a nengō (元年 gannen) starts whenever the emperor chooses; and the first year continues until the next lunar new year, which is understood to be the start of the nengō's second year. - - - Timeline in the WIKIPEDIA !
. 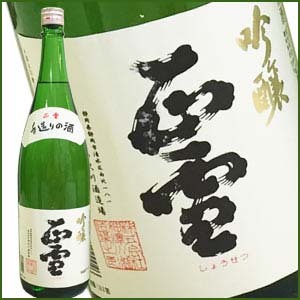 Keicho no Eki 慶長の役 Fight of Keicho . Tokugawa Ieyasu founded the Edo Bakufu in Keicho 8. He passed on the title of Shogun to Hidetada in Keicho 10. Banning Christianity followed in Keicho 18 (1613). 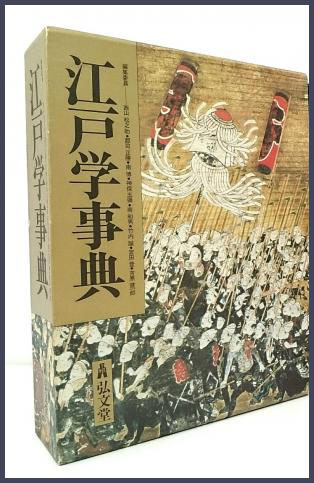 大坂冬の陣 Osaka Fuyu no Jin, the Winter Siege of Osaka and final victory for the Tokugawa government was in Keicho 19. (1615). - - . 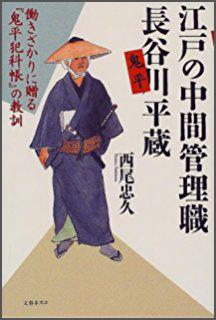 Buke Shohatto 武家諸法度 laws for the Samurai .
. Unpei fude 雲平筆 Unpei brush - Fujino Unpei 藤野雲平. Empress Meishō, 1629–1643; Emperor Go-Kōmyō, 1643–1654. Kanei 01 - Spanish trade ships were banned. Kanei 10 - Japanese were forbidden to travel outside of Japan - Sakoku policy was firmly installed. Kanei 11 - Building of 出島 Dejima island in Nagasaki. 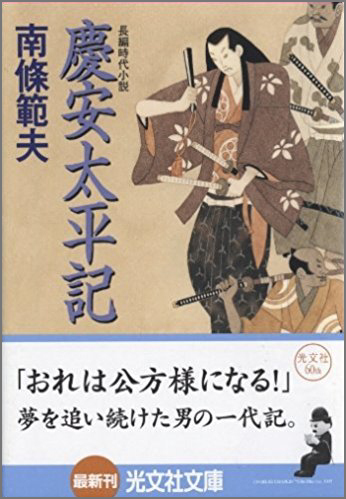 Kanei 12 - Buke Shohatto Samurai laws became even stricter. 参勤交代 Sankin Kotai visits to Edo were enforced. Kanei 14 - . 島原の乱 Shimabara no Ran Rebellion . Kanei 19 - 1642 . 寛永の大飢饉 Great Famine of Kanei .
. Kaneiji 寛永寺 Kanei-Ji - Temple in Ueno . Keian 06 - 1651 . Keian jiken 慶安事件 The Keian uprising . 1652 承応 Jōō also Shōō; Emperor Go-Sai, 1655–1663. Meireki 03 - . Great Fire of Meireki 明暦の大火 . 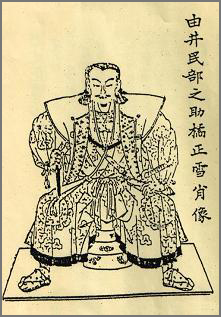 1661 寛文 Kanbun Emperor Reigen, 1663–1687. Tenna 02 - . Great Fire of Tenna 天和の大火 . 1684 貞享 Jōkyō Emperor Higashiyama, 1687–1709. Genroku 11 . Chokugaku Fire 勅額火事 .
. 元禄 Haiku Poets of the Genroku period . This period spanned the years from ninth month of 1688 through third month of 1704. The reigning emperor was Higashiyama Tennō (東山天皇). 1704 宝永 Hōei Emperor Nakamikado, 1709–1735. Hoei 04 - 1707 . 富士山が噴火 Great Eruption of Mount Fujisan . 1716 享保 Kyōhō Emperor Sakuramachi, 1735–1747. Kyoho 17 - 1732 . 享保の大飢饉 Great Famine of Kyoho . 1744 延享 Enkyō Emperor Momozono, 1747–1762. Horeki 10 - . Hōreki Fire 宝暦の大火 Horeki Fire . 1764 明和 Meiwa Emperor Go-Momozono, 1771–1779. Meiwa 09 - . Great Fire of Meiwa 明和の大火 . 1772 安永 An'ei (Anei) Emperor Kōkaku, 1780–1817. Tenmei 03 - . 天明の大飢饉 Great Famine of Tenmei . 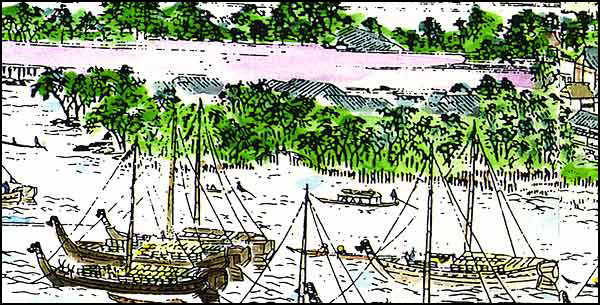 Tenmei 04 - 1784 . Tenmei inflation of currency . 1804 文化 Bunka Emperor Ninkō, 1817–1846. Bunka 03 - . Great Fire of Bunka 文化の大火 . Bunsei 12 - . Great Fire of Bunsei 文政の大火 . 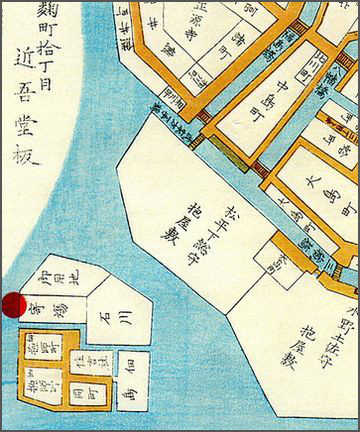 Tenpo 03 - 1832 . 天保の大飢饉 Great Famine of Tenpo . 1844 弘化 Kōka Emperor Kōmei, 1846–1867. Kaei 06 - 1854 . Commodore Perry and the "black ships" ペリー来航 - 黒船 . Keio University (慶應義塾大学 Keiō Gijuku Daigaku), abbreviated as Keio (慶應) or Keidai (慶大), is a Japanese private university located in Minato, Tokyo. It is known as the oldest institute of modern higher education in Japan. Founder Fukuzawa Yukichi originally established it as a school for Western studies in 1858 in Edo (now Tokyo). 1868 明治 Meiji - Emperor Meiji, 1868–1912.
. Reiwa Jidai 令和時代 Reiwa period . Starts in May 2019. Heisei comes to an end. .. a failed coup d'état attempt carried out against the Tokugawa shogunate of Japan in 1651, by a number of rōnin. Though it failed, the event is historically significant as an indication of a wider problem of disgruntled ronin throughout the country at the time. Masterminded by Yui Shōsetsu and Marubashi Chūya, the uprising is named after the Keian era in which it took place. At the same time, Yui would lead a second group and seize the Tokugawa stronghold in Sunpu (modern-day city of Shizuoka). Further action was planned for Osaka Castle and Kyoto. They timed their rebellion to take advantage of the death of Shogun Tokugawa Iemitsu, as his successor, Ietsuna, was still a child. The conspirators aimed to force the shogunate to relax its policies of seizing hans and dispossessing daimyōs, which under Iemitsu had deprived tens of thousands of samurai of position and income, adding them to the ranks of ronin. In the aftermath of the suppression of the uprising, the Shogunal Elders (Rōjū) met to discuss the origins of the uprising, and how to prevent similar events from occurring in the future. Originally, most of the Elders sought to take severe measures, including expelling all ronin from the city, but they were eventually convinced by Abe Tadaaki to take a more rational tack. He suggested reducing the number of ronin opposed to the shogunate, not through expulsion, but by introducing more favorable policies. In particular, he convinced the council that the shogunate ought to do away with the law of escheatment, and to work to help ronin settle into proper jobs. Forcefully expelling a great number of people from the city, he argued, would only serve to create more opposition to the government. Far from being an isolated incident, the Keian Uprising was followed by an event the following year involving several hundred ronin, and another soon afterwards in Sado. Granted, these were not directly related, that is, none of the persons involved were the same, nor did they follow a single leader or organized ideology. Despite this, or perhaps because of it, it is significant to note how widespread the distaste for the shogunate was at this time, and the degree of the "problem" of the ronin throughout the country. a military strategist, and leader of the unsuccessful 1651 Keian Uprising. Though a commoner, and thus not officially of the samurai class, Yui was known as one of the "Three Great Ronin" along with Kumazawa Banzan and Yamaga Sokō. Born in Sunpu to humble origins, Yui is said to have been a talented youth; he was taken in by a number of rōnin from the area, who taught him recent history, and likely swordsmanship and military strategy as well. As an adult, he found employment as an instructor at a samurai academy, teaching swordsmanship and related disciplines. But these academies, which could be found throughout the country, served not only the pure function of schools of martial arts; certainly, discipline, ethics, and related arts were taught as well. But the schools also served as social and intellectual spaces, in which political ideas were discussed, and grievances aired in a familiar environment where comrades and friends met. Students were almost exclusively members of the samurai class, but running the full gamut of rankings, from daimyo to ronin. As regulations were made stricter at this time, and many ronin expelled from their domains, the number of students grew dramatically. He later opened a school of military strategy and martial arts in the Renjaku-chō neighborhood of Kanda in Edo, as well as an armorer's shop and ironworks. Here he continued to gain contacts, friends, and prestige among the ronin and others; one of them was Marubashi Chūya, a samurai and fellow instructor of martial disciplines and strategy, with whom he would plan the Keian Uprising some years later. 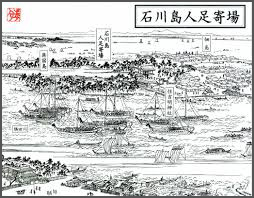 Beginning in 1645, Yui plotted a coup against the Tokugawa shogunate along with Marubashi, a small group of rōnin, and a number of their students. It was to take place in 1651, shortly after the death of Shogun Tokugawa Iemitsu, and would later come to be known as the Keian Uprising. Unfortunately for Yui and his comrades, the plot was discovered before it truly began. Yui was in Sunpu, preparing to execute a secondary series of attacks when Marubashi was arrested in Edo; surrounded by shogunate officials, he committed seppuku rather than be captured. Following his death, the officials performed a variety of obscenities upon his body, and then proceeded to subject his parents and other close relatives to crucifixion. Yui Shōsetsu, though ultimately unsuccessful in his political plots, is a notable figure as representative of the growing political unrest in the early Edo period, as a result of strict laws put forth, and enforced, by the shogunate. He and his conspirators were only one of many groups throughout the country meeting in samurai academies and other venues, discussing politics and current events. Most, of course, did not act upon their beliefs as Yui and Marubashi did, but that discussion existed among a great number of people, despite, or perhaps because of the shogunate's strict enforcement of its laws, is significant. 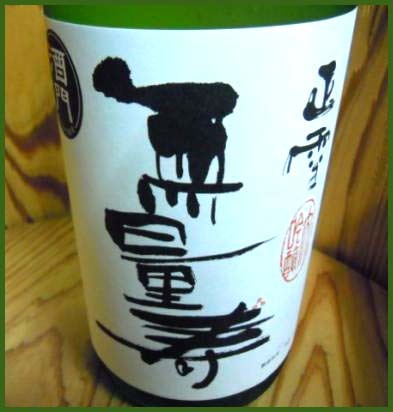 There is even a line of Sake rice wine named after Yui Shosetsu. This animal begun to appear in Shizuoka after the violent death of Yui Shosetsu. They say his soul reincarnated to haunt the place of his birth and death. It is also called カトンボ Chikara tonbo and begins to fly in early summer. It is only seen in Shizuoka! 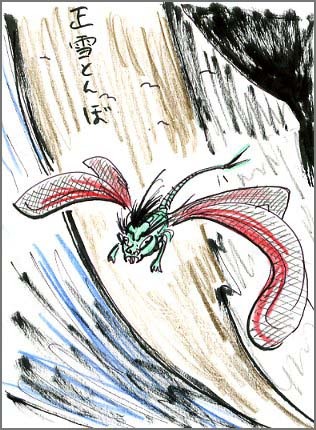 This animal, a kind of kawatonbo 川とんぼ river dragonfly, is now extinct.
. tonbo (tombo, tonboo) 蜻蛉 dragonfly . Chūya was a ronin (masterless samurai) from Yamagata, and instructor in martial arts and military strategy, most famous for his involvement in the 1651 Keian Uprising which sought to overthrow Japan's Tokugawa shogunate. He is said to have been a man of great strength and good birth whose distaste for the shogunate stemmed primarily from a desire for revenge for the death of his father, killed by the shogunal army at the 1615 siege of Osaka. The identity of his father is not clear, but may have been Chōsokabe Motochika.
. 神霊山 Shinreizan 金乗院 Konjo-In 慈眼寺 Jigen-Ji . is a specialized weapon that was used by police in Edo period Japan. It is also spelled jutte. In feudal Japan, it was a crime punishable by death to bring a sword into the shogun's palace. This law applied to almost everyone, including the palace guards. Due to this prohibition, several kinds of non-bladed weapons were carried by palace guards. The jitte proved particularly effective and evolved to become the symbol of a palace guard's exalted position. the jitte was a substitute for a badge, and it represented someone on official business. It was carried by all levels of police officers, including high-ranking samurai police officials and low-rank samurai law enforcement officers (called okappiki or doshin). Other high-ranking samurai officials carried a jitte as a badge of office, including hotel, rice and grain inspectors (aratame). The jitte is the subject of the Japanese martial art of jittejutsu. Jitte may have a small pointed tip or blade attached to the tsuka and hidden in the boshin. Jitte could be highly decorated with all manner of inlays and designs or very plain and basic depending on the status of the owner and the jitte's intended use. Jitte could range in length from around 12 inches to over 24 inches. The modern jitte is about 45 cm (18 inches) long with no cutting edge and a one-pronged tine, called kagi, about 5 cm long starting just above the hilt and pointing toward the tip sentan. A popular misconception is that the kagi is used to catch a sword. It could possibly be used for this purpose, but the hook's proximity to the hand would make it rather dangerous. When faced with a swordsman, a more likely use for the hook would be to capture and arrest the blade after blocking it with the boshin. The kagi's more common use is to hook into clothing or parts of the body like the nose or mouth, or to push into joints or other weak points on the body. It also could be used to hook the thumb while holding the weapon backwards, to allow different techniques such as punches and blocks, very similarly to a sai. 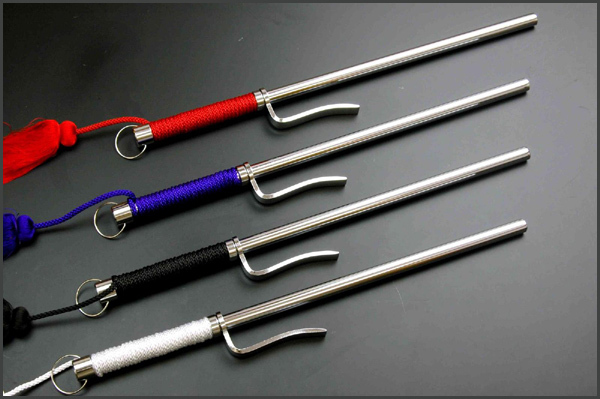 The jitte can also be used in much the same manner as other short sticks or batons, to strike large muscle groups and aid in joint manipulation. Boshin, the main shaft of the jitte which could be smooth or multi sided. The boshin of most jitte were usually iron but some were made from wood. Sentan, the tip or point of the jitte. Kagi, the hook or guard protruding from the side of the jitte. Jutte may have more than one kagi with some jitte having two or three kagi. Kikuza (chrysanthemum seat), if the kagi is attached to the boshin through a hole in the boshin, the protrusion on the opposite side is called a kikuza. Tsuka, the handle of the jitte which could be left plain, it could also be wrapped or covered with various materials. Tsukamaki, the wrapping on the handle (tsuka). Materials such as ray skin same', leather, and cord were used for tsukamaki on jittes. Kan, the ring or loop at the pommel of the tsuka. A cord or tassel could be tied to the kan.
Tsuba, a hand guard present on some types of jitte. Koshirae. Jitte can occasionally be found housed in a sword type case hiding the jitte from view entirely, this type of jitte can have the same parts and fittings as a sword including:seppa, tsuba, menuki, koiguchi, kojiri, nakago, mekugi-ana and mei. Naeshi or nayashi jitte have no hook or kagi. the iron truncheon and arresting cord art practiced by the feudal Edo police, is one of the arts transmitted within Masaki-ryu Nakajima-ha. The art is broadly comprised of Ikkaku (forms practiced with a single jitte) and Sokaku (forms practiced with a jitte in one hand and a hananeji/naeshi in the other). 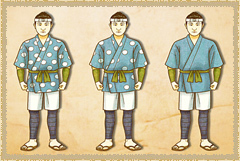 The Sokaku forms are comprised of Namite Sokaku (Jujiken), Sakate Sokaku (Hachijiken), Manji Sokaku (Manjiken) and Hoyo Sokaku. 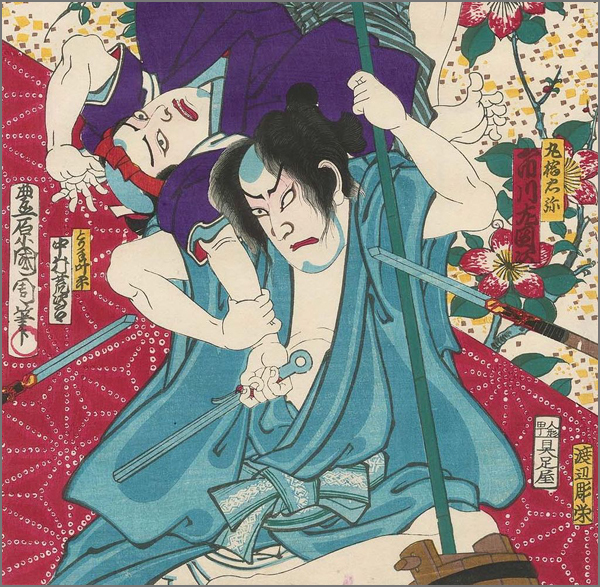 Namite Sokaku and Sakate Sokaku are mainly used to restrain a violent swordsman, and Hoyo Sokaku include special tactics such as throwing the jitte. Manji Sokaku is mainly comprised of techniques against polearms and chain weapons. 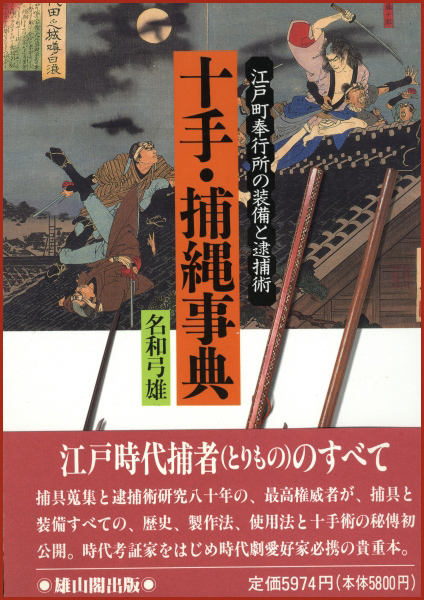 Edo Machikata Jitte Torinawa Atsukaiyo, the iron truncheon and arresting cord art practiced by the feudal Edo police, is one of the arts transmitted within Masaki-ryu Nakajima-ha. The art is broadly comprised of Ikkaku (forms practiced with a single jitte) and Sokaku (forms practiced with a jitte in one hand and a hananeji/naeshi in the other). 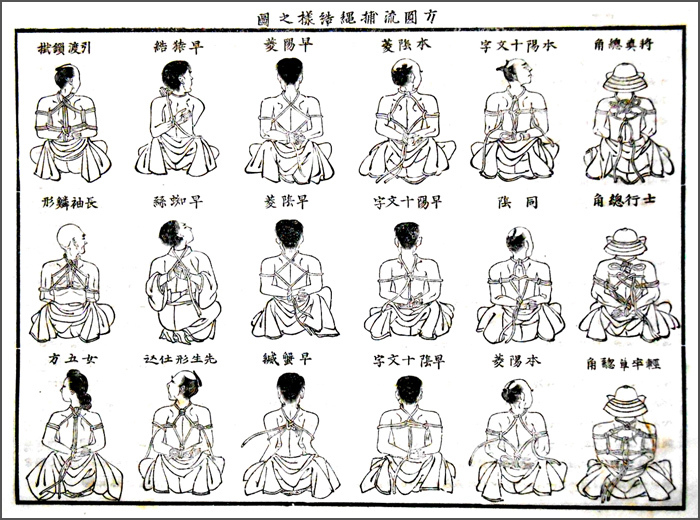 The Sokaku forms are comprised of Namite Sokaku (Jujiken), Sakate Sokaku (Hachijiken), Manji Sokaku (Manjiken) and Hoyo Sokaku. The first Yoseba was constructed at Ishikawajima 石川島 Ishikawa Island in 1790. What was the prevailing attitude regarding the purpose of punishment during the Edo period? This focus on particular prevention was especially apparent in the ninsoku yoseba, a special facility for criminals regarded as capable of rehabilitation. The ninsoku yoseba was opened in 1790 at the recommendation of hitsuke tôzoku aratemekata chief Hasegawa Heizô — who was also its first director — and the approval of rôjû Matsudaira Sadanobu. Its inmates were those convicted of minor crimes, as well as mushuku, people whose names had been removed from the family register and were excluded from lawful social activities (including people who had been banished for earlier crimes). At the ninsoku yoseba, these people received lessons in ethics and vocational training of various types. Moreover, the inmates were actually paid for the products of their labors, a practice virtually unheard of at the time. According to their performance, inmates were allowed to wear robes with less and less white dots, as they reached the time limit to go free. They were helped to find work in the line they had been trained at the Yoseba. 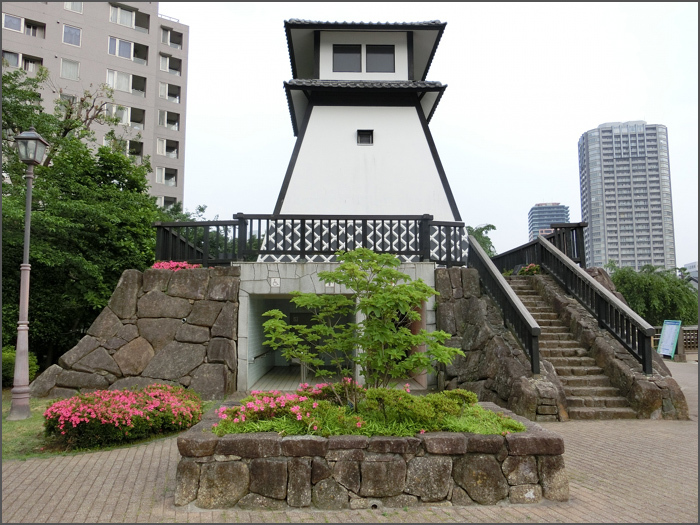 The Ishikawa Lighthouse memorial at the remains of the Yoseba, now in 佃公園 Tsukuda Park. 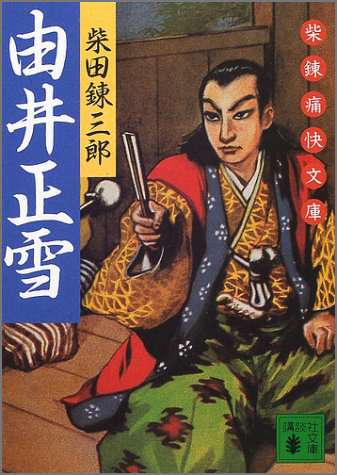 is a popular series of stories and television jidaigeki in Japan. 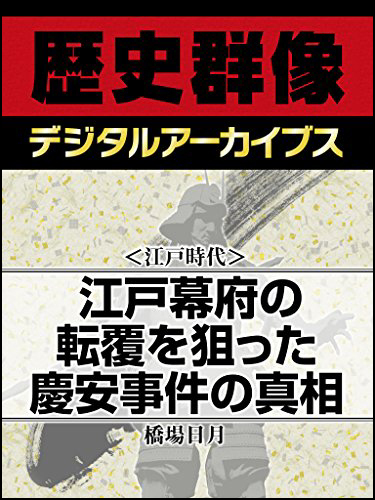 It has been based on a novel by 池波正太郎　Shōtarō Ikenami which started in the December 1967 issue of the light novel magazine "All Yomimono (ja)" published by Bungei Shunjū which published the first hard cover the following year. 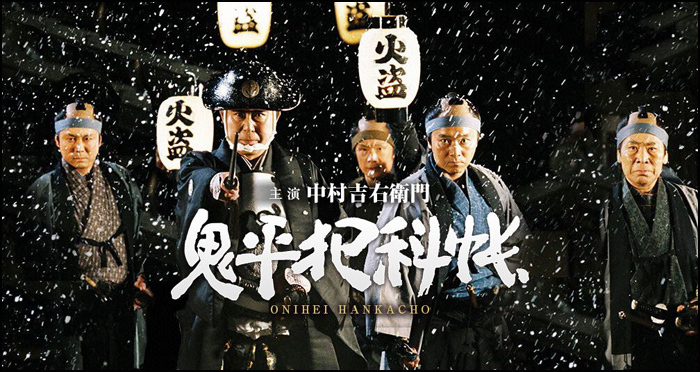 Onihei Hankachō developed into a series, and adaptations into TV programs, a film and theater followed. A TV anime adaption aired in 2017. The title character is Hasegawa Heizō, who started as a chartered libertine before succeeding his father as an heir and was appointed the head of the special police who had jurisdiction over arson-robberies in Edo. 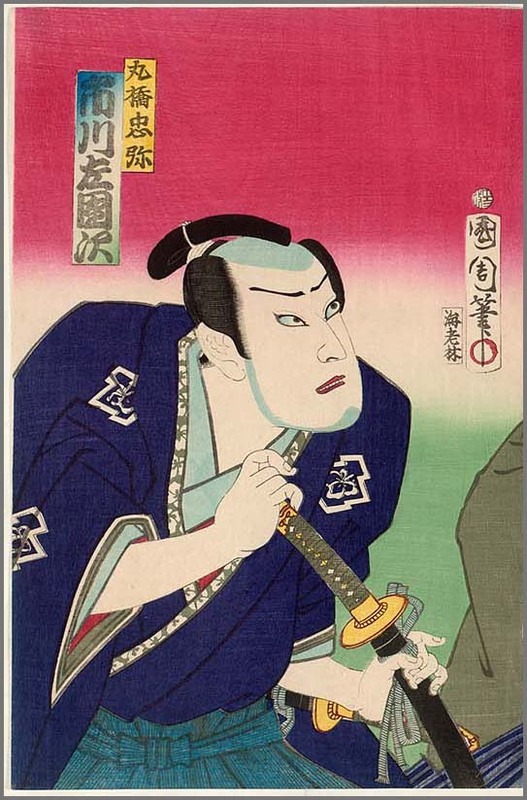 Nicknamed by the villain "Onihei," meaning "Heizō the demon," he led a band of samurai police and cultivated reformed criminals as informants to solve difficult crimes. Later, he was titled "Hitsuke tōzoku aratamekata" (police force for arson and theft), and opened an office at his official resident. 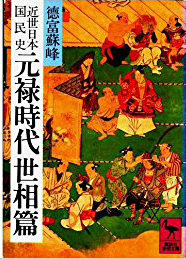 Hiramatsu Yoshiro, “Ninsoku yoseba no Seiritsu"
. Hasegawa Heizoo, Hasegawa Heizô 長谷川平蔵　Hasegawwa Heizo . jishinban　自身番　/ kidoban 木戸番 Guardian of a neighbourhood "gate"
jitte, jittei, jutte 十手 / 實手 metal truncheon, "ten hands"
. 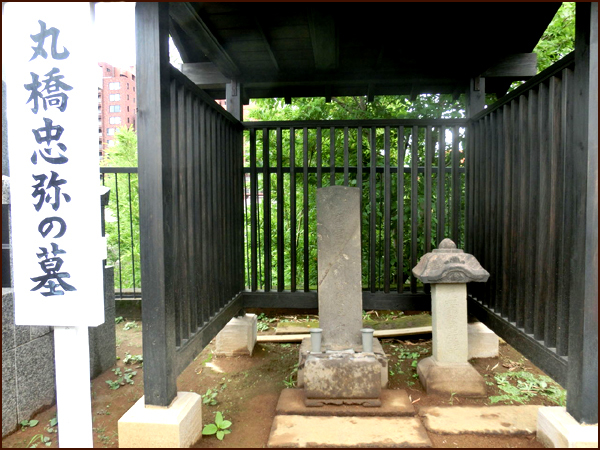 Nawa Yumio - Contents of the book .
. Kubizuka 首塚 memorial stone pagodas and mounds for the beheaded . 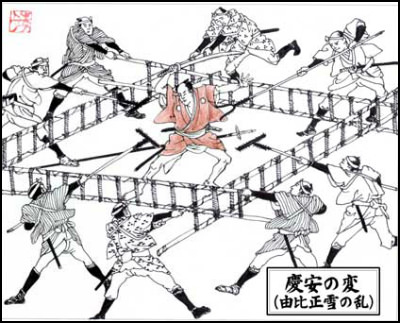 In feudal Japan, individual military and citizens groups were primarily responsible for self-defense until the unification of Japan by Tokugawa Ieyasu in 1603. During the Edo period (1603–1868), the Tokugawa shogunate formed a centralized feudal government. Samurai warriors who once protected Japan from foreign enemies and fought each other for supremacy became the new police and internal security force. Their new job would be to ensure civil peace, which they accomplished for over 250 years. During the Edo period the authoritarian Tokugawa shogunate instituted an elaborate police/security state, an administrative hierarchy was developed, and rules and regulations controlling many aspects of life in Japan went into effect. This new system of government has been called a police state, possibly the world's first. the samurai era ended with the overthrow of the Tokugawa shogunate and a new government came into power (Meiji government) and the samurai class was eventually abolished. In 1872, a former samurai [Kawaji Toshiyoshi] was sent to Europe to study systems of policing and he recommended a restructuring based partially on French and Prussian systems. In 1874, a nationalized police force was created using European police systems as a model. This new police force was the start of the modern police system in Japan, though it was initially dominated by former samurai from Satsuma who were part of the driving force behind the removal of the Tokugawa shogunate. The new Meiji period police continued the Edo period method of Japanese police controlling societal behavior and internal security as well as preventing and solving crimes. The Edo period police apperatus utilized a multi-layered bureaucracy which employed the services of a wide variety of Japanese citizens. High and low ranking samurai, former criminals, private citizens and even citizens groups (Gonin Gumi) participated in keeping the peace and enforcing the laws and regulations of the Tokugawa shogunate. During the Edo period, high ranking samurai with an allegiance to the Tokugawa shogunate (hatamoto) were appointed machi-bugyō (city administrators or commissioners). The machi-bugyō performed the roles of chief of police, prosecutor, judge and other judicial related business both criminal and civil in Edo and other major towns. Working under the machi-bugyō was the yoriki. Yoriki were samurai—they managed patrols and guard units composed of lower ranking police officials. Yoriki, being of a higher class, were able to ride a horse while performing their duties and were trusted to carry out assignments of high importance. Working under the yoriki was the dōshin. Dōshin were samurai but of a lower class than yoriki—they performed the duties of prison guard and patrol officer which required close contact with commoners (chonin). They investigated crimes such as murder and helped with executions. relied heavily on commoners for assistance, from average village dwellers to the outcast hinin and eda castes. 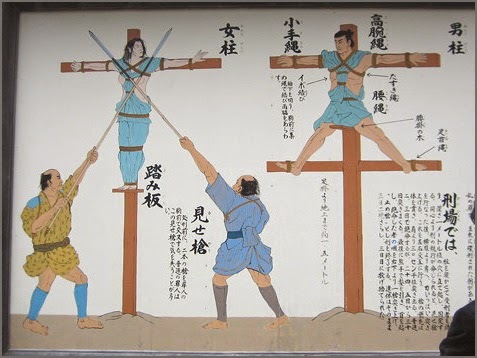 Members of the Japanese outcast were particularly helpful with guarding and executing prisoners, and disposing the bodies, something that samurai found to be repugnant (distasteful). Komono were non-samurai chōnin who went with the dōshin on patrols and provided assistance. Okappiki were non-samurai from the lowest outcast class, often former criminals who worked for the dōshin as informers and spies. Gōyokiki or meakashi were a non-samurai chōnin or outcast class who were hired by local residents and merchants to work as police assistants in a particular neighborhood—they were often former criminals. The term "tesaki" was used to describe gōyokiki or meakashi later in the Edo period. Investigating crimes, arresting and interrogating arrested suspects, torturing criminal suspects in order to obtain a confession, punishing convicted criminals including executions. Edo period police used a variety of armor and carried lethal and non-lethal weapons to capture criminal suspects. If possible, suspected criminals were taken alive. This meant that special weapons and tactics had to be created in order to accomplish this task. Edo period police stations were required to keep six kinds of weapons (bansho rokugin or keigo roku-go) available for use in case of disturbances. these were the kanamuchi, the kiriko no bo, the tetto, the sodegarami, the tsukubo, and the sasumata. [Three of these tools were called torimono sandōgu ("three tools of arresting"), which consisted of the sodegarami, sasumata, and tsukubō. They were symbols of office and were often displayed in front of police checkpoints or used in processions, especially while convicted prisoners were being led to their execution. Jitte, Jutte: an iron or wooden club or truncheon, the jutte was a non-lethal weapon and an official symbol of office. Te yari (hand spear): a small version of the yari suitable for use in confined spaces. Edo period police and assistants wore chain armour clothing, armour for the hands, and armour for the head. Kusari katabira and kusari zukin (chain armor jacket and hood).